The past few weeks have been a whirlwind – as soon as I seem to be back in London and on top of my to-do list I’m heading off somewhere new. Of course, I’m loving every minute but it has certainly been chaotic which is why this particular post ranges from France to Sussex and back to Shoreditch and Trafalgar Square. Monet’s House at Giverny. Own photograph. A few days after Berlin Gallery Weekend I was woken up in the very early hours to head over to France for the Bank Holiday weekend. 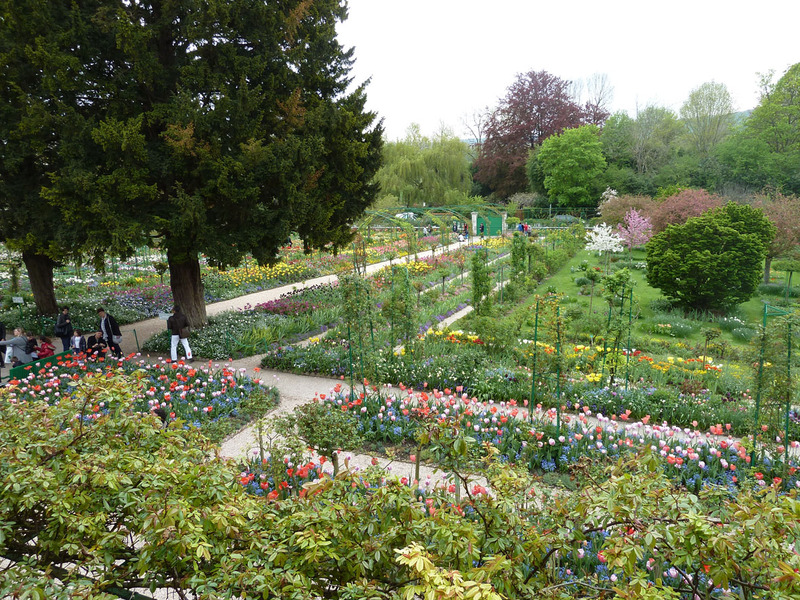 I’ve always wanted to visit Giverny and, as it was only an hour off route (heaven forbid that I could just relax and enjoy French wine and cheese), we programmed the sat-nav and off we went. Entry to Giverny provides access to Monet’s house and garden. This was the second pink house with green shutters in which Monet had lived and the second time his house had been separated from the garden by a road. Colour is everything here – both inside and out. The walls of the house are adorned with works – there are Japanese prints everywhere plus his huge collection of paintings including works by Delacroix, Cézanne and Renoir. 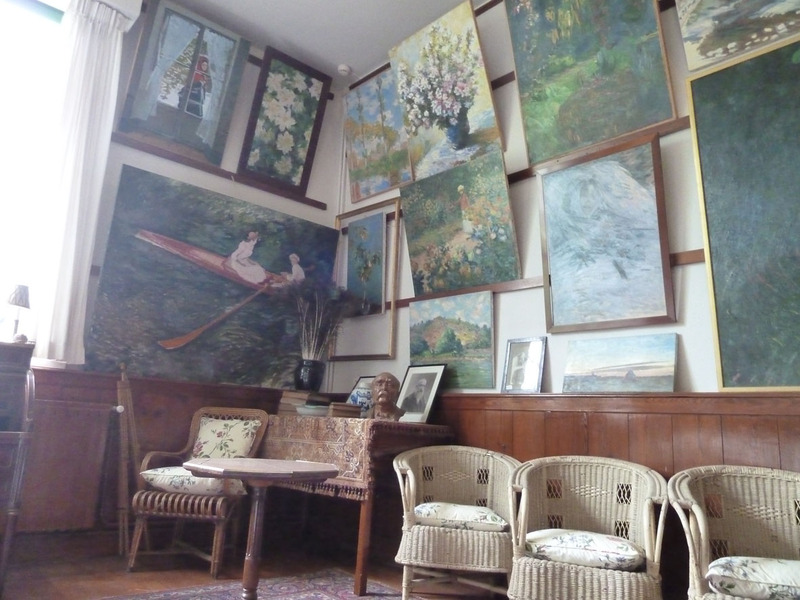 Inside Monet’s House. Own photograph. Even on an overcast day, the garden cannot help but make you smile with its full-to-the-brim flowerbeds and radiant colours. 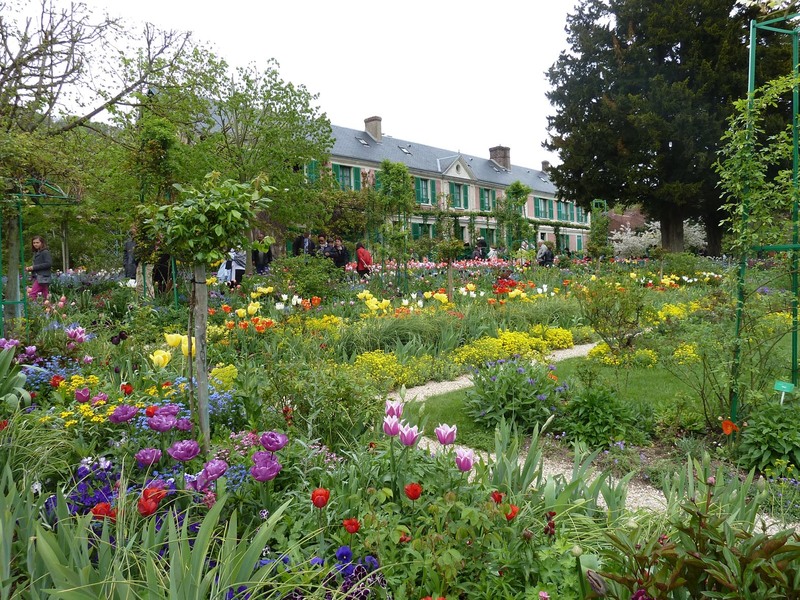 Monet had started gardening while living at Argenteuil but not on a scale that would suggest the passion he imbued into the gardens at Giverny. His garden was designed with his paintings in mind – he planted what he wanted to paint so, in a sense, he created the scene that resided in his imagination. 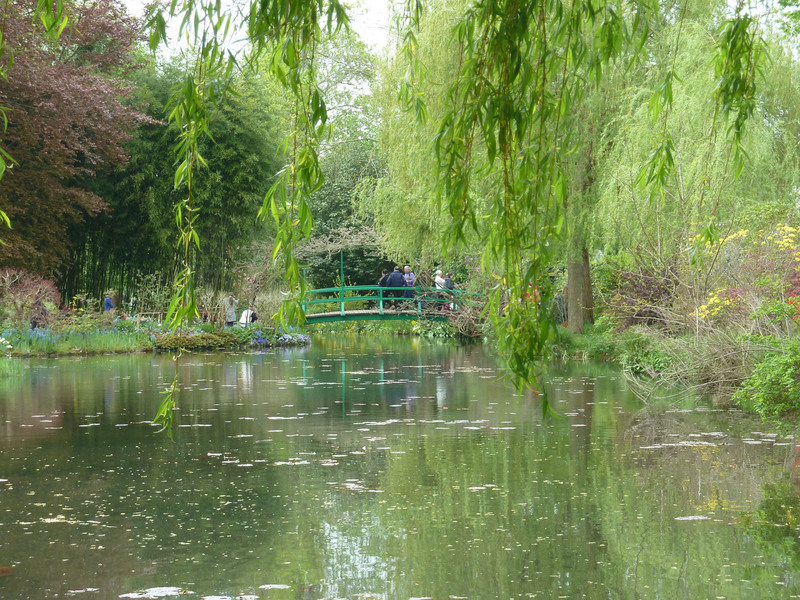 When Monet arrived at Giverny there were no ponds but it had always been his dream to have them and it is, of course, his water lily ponds and the Japanese bridge that have become synonymous with his name. The Japanese bridge. Own photograph. Monet was severely afflicted by cataracts despite two operations towards the end of his life. As his sight worsened, his works turned from fresh, bright colours to a heavier palette, almost certainly as a result of his blurred colour vision. Whether or not his gardens became lost to him is hard to say but what can be certain is that his pronounced choices of colour infused his world with light and life for many years and helped to create some of the scenes we remember him for today. 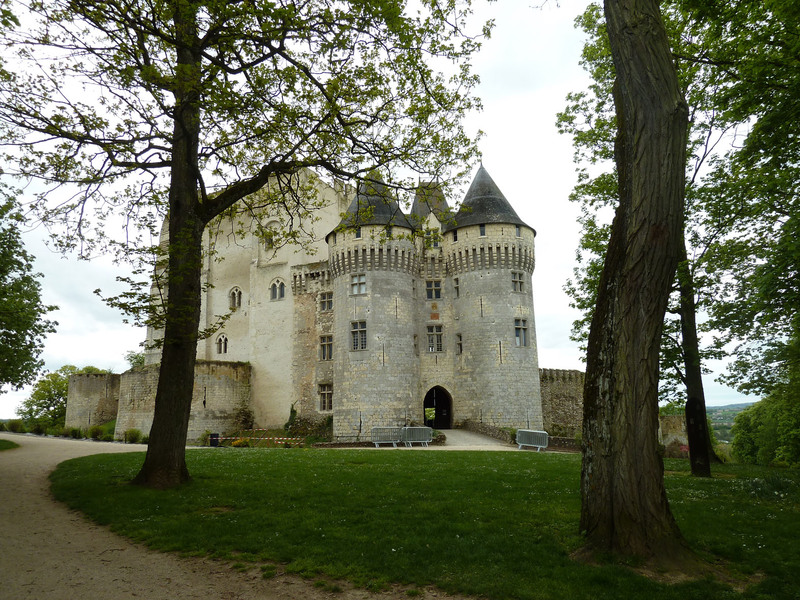 After settling in at Nogent-Le-Rotrou, it was irresistible to visit the Chateau Saint-Jean as it was only two minutes away. Built around 1020 on the site of an earlier castle, the building has suffered a lot of intervention over the years and much of what remains is of a later period. It is an imposing and impressive fortress perched on a point with a vantage over the entire area. Inside there is a museum dedicated to the history of the town and, strangely enough, a contemporary art gallery with an exhibition of works by Patrick Loste, evoking the often crude portrayals of cave paintings. I can find art anywhere! 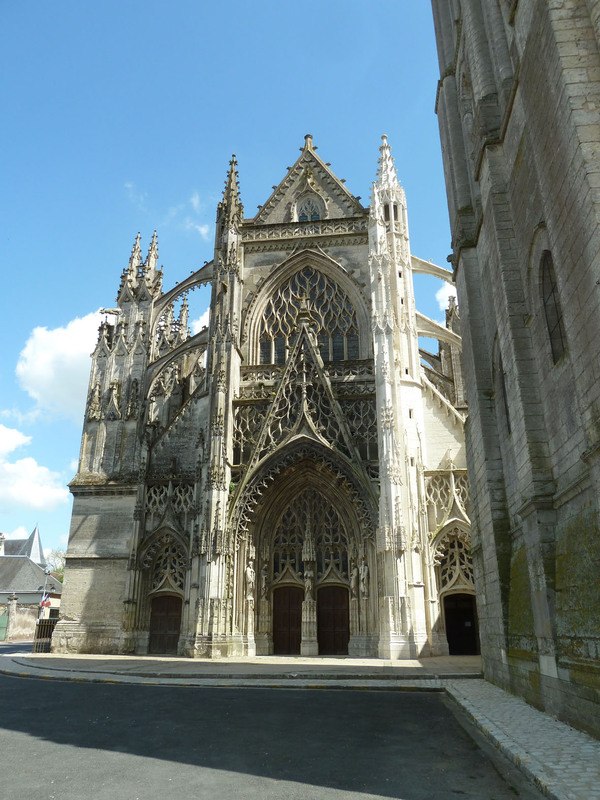 It was a flying visit to France but, on the way back home, there was just time to stop in at the Holy Trinity Abbey in Vendôme enabling me to indulge my love of the Gothic period. The feature of most note has to be the 12th century frescoes that were discovered behind the 14th century chapter house walls. The sections that remain are badly fragmented the sections but have been preserved remarkably well and one scene showing the Miraculous Catch after Christ’s Resurrection is still strikingly clear consider its age. Holy Trinity Abbey, Vendôme. Own photograph. Back in the UK, it was time for the opening of the opera season at Glyndebourne, the wonderful opera house in Sussex founded in 1934. As tempted as I am to do so, I will resist touching on the opera but do have to mention their art programme. As many of you will know, I am very into public installations and making the most of outdoor spaces through art. 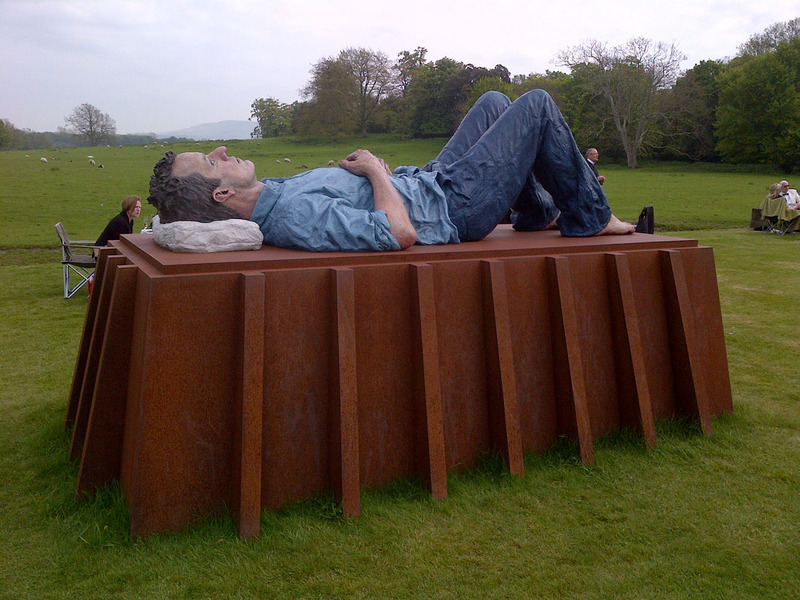 Glyndebourne are very much on the same page and this season is marked by an exhibition of works by Sean Henry who does exactly this, creating monumental works in bronze for the urban landscape. His works capture the mundane, subjects caught in a moment of introspection with which we can identify. Glydnebourne don’t have the strongest selection of his sculptures but they are unavoidable in the picturesque landscape of the house. Sean Henry, Catafalque, 2003. Own photograph. Finally, it seemed I was back in London for long enough to get around some exhibitions here. 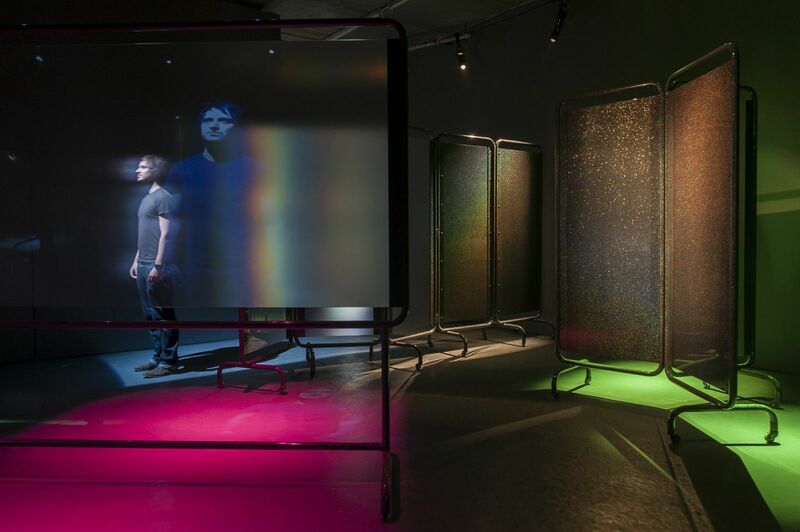 The Catlin Art Prize is a highlight of the calendar and the brilliant eye of the curator means that we can normally expect great things from the nine chosen graduates who have had to produce new work for the exhibition. 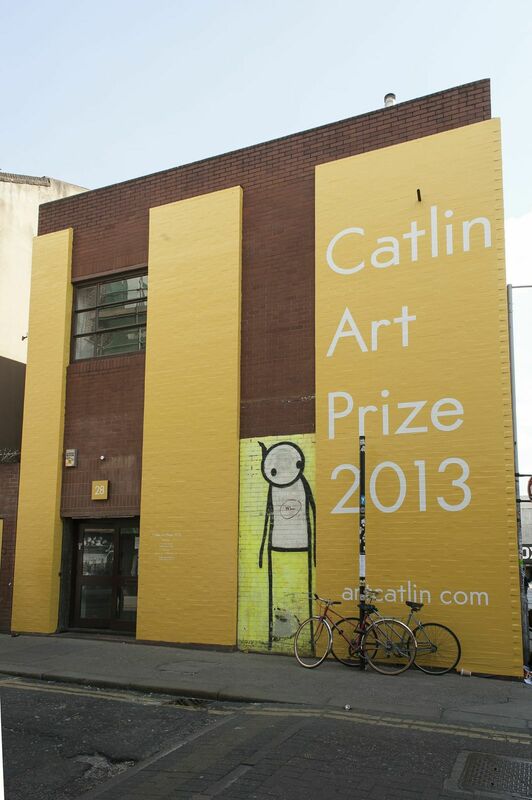 The Catlin Prize takes over Londonewcastle. Image courtesy of Peter Hope and via www.artcatlin.com. The winner Terry Ryu Kim forced the visitor to become part of her installation – manipulating the viewer’s path through architecture and technology. The work explores how structures can exert power, the installation becomes a stage that dictates our actions. It is haunting and beautiful, both intimate and evasive at the same time. Terry Ryu Kim, Screening Solution I,II and III. Image courtesy of Peter Hope and via www.artcatlin.com. 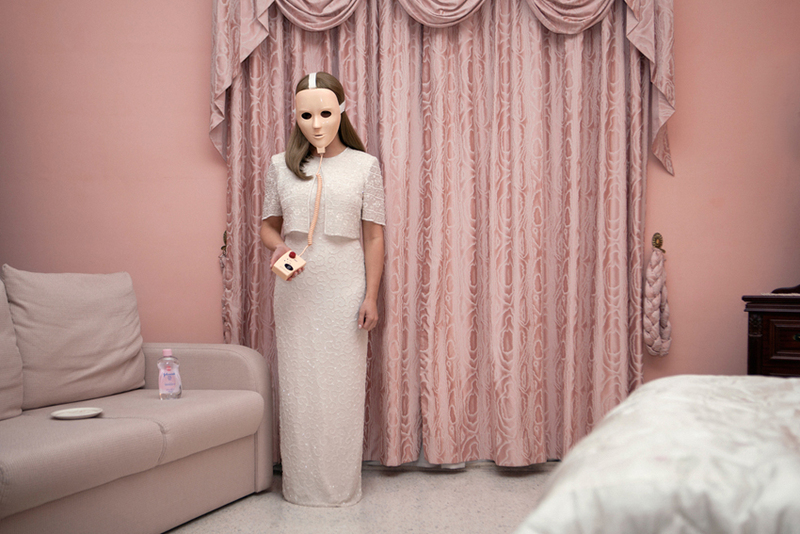 Juno Calypso who won the visitor vote has garnered a lot of attention, using the more traditional medium of photography. Calypso staged scenes in which she performs as a character called Joyce, always obscuring her face and thereby forcing us to focus on other elements of the scene. The narrative of the unsettling seems to be a theme in this year’s award. Juno Calypso, 12 Reasons You’re Tired All The Time. Image via www.artcatlin.com. All of the finalists deserve mention but I think praise must be given to Nicky Deeley. Of course, performance art is common now but for a young graduate to produce a work of such maturity is impressive. 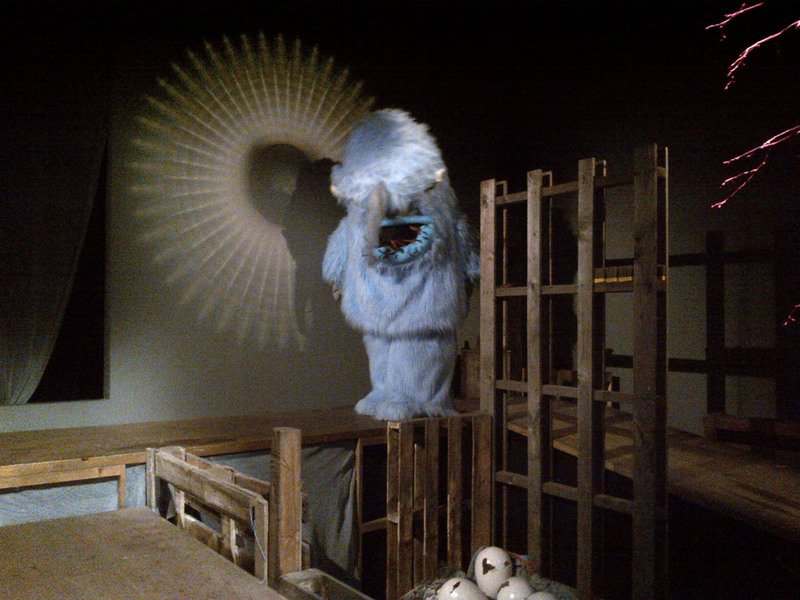 The piece sits deftly on the line between creepy, cute and fascinating. Admittedly I only saw one costume change but the crowds of people gathered around the work certainly suggested everyone was hooked. Nicky Deeley performing Island Year. Own photograph. I can often be hard to please and so regularly gallery spaces rest on their laurels. One may think this is more true of traditional spaces that are guaranteed the crowds come what may. Well, The National Gallery is currently shaking things up. 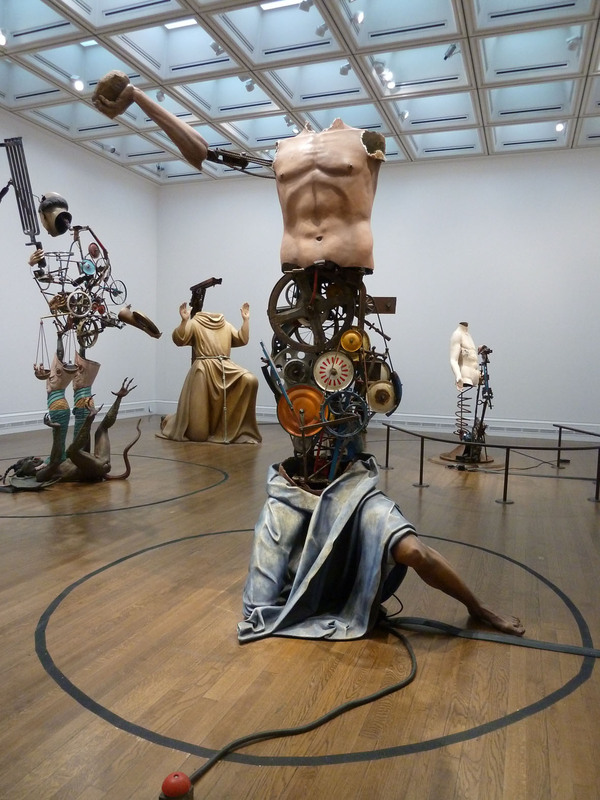 Michael Landy’s Saints Alive is a result of a two year residency with an in-house studio. Many artists in the past have failed this challenge but Landy has risen to it. He wasn’t scared of the esteemed regard in which everyone holds the National Gallery’s collections. Everything that made him seem the most inappropriate person for this position has actually made him the best. Saints Alive at The National Gallery. Own photograph. Asked my thoughts on The NG I would normally name it as a place of calm, a space where one can think and admire some of the most wonderful art in London. It was the first gallery I visited as a child and somewhere I still regularly visit. As I approached the Sunley Room I could hear crashes and bangs, normally such noises would have the guards running to find the source of the disturbance. But the disturbance is, in fact, part of the exhibition. Landy has subverted the serenity. Walking in I was met by Saint Apollonia, a nine-foot sculpture made of fibre glass, recalling a sculpture painted in a Lucas Cranach work. I nervously edged towards the pedal at her feet, balancing precariously on a stiletto and pressing it down. At this point the pliers she was holding smashed persistently into her mouth. There’s a spare head ready for when this one becomes a tad too battered. She is not the only one who is bringing to life the suffering the saints endured. Saint Apollonia in the Sunley Room. Own photograph. Landy has been inspired by the stories of the saints – stories which were once known by everybody yet today have fallen into obscurity. Towering over visitors are seven large-scale kinetic sculptures that swivel and turn, evoking the torment of each saint’s life. These sculptures are interactive; there are buttons to press, a handle to crank and foot pedals to push. There are T-shirts to be won and a Saint Francis of Assisi donation box activated by coins. One of Landy’s kinetic sculptures. Own photograph. 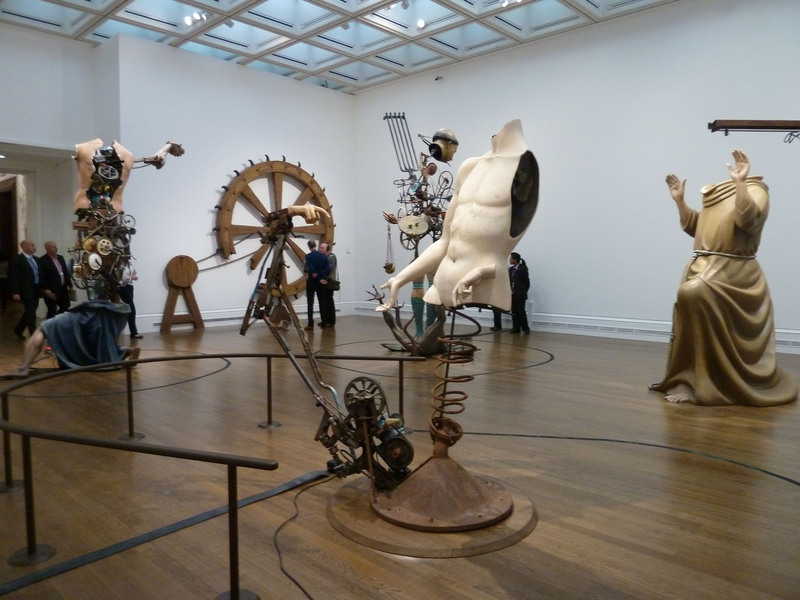 Landy doesn’t intend to cause offence with these sculptures; his research into the works in the collection and his retelling, through these kinetic beasts, of the saints’ stories is remarkable. Each saint has a symbolic attribute that makes him or her instantly recognisable. Landy has transformed the saints from objects of spiritual devotion into artworks, made from pieces of junk that play on his interest in destruction. Landy brings the saints from the walls of the gallery to life. They are fascinating. We want to press the buttons again and again – are they unnerving or are they funny? I don’t think anyone was quite sure. The legends themselves are often ridiculous and Landy has captured this with his own unique magic, comedy and an enticing undertone of the macabre. The awful and gruesome ordeals these saints underwent were meant to show their patience and endurance. As the sculptures break under the strain there is a certain irony here. And don’t think that’s not fully intentional either. Landy’s past works have always been about selflessness, generosity and virtue so he wasn’t actually as far removed from these topics as many thought. 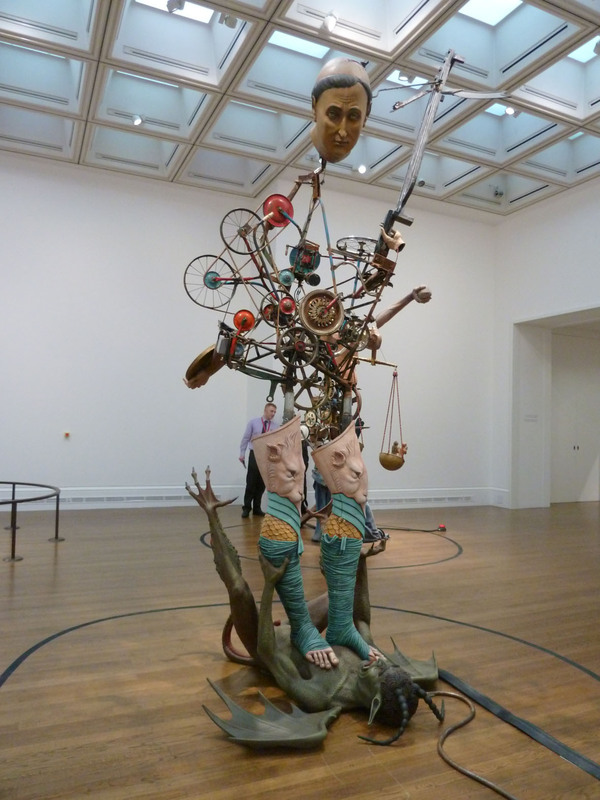 Alongside the sculptures are his drawings and collages made from cut-up reproductions of works in the collection. I’d urge you not to get so distracted by the sculptures that you miss these. Saint Jerome in action. Own photograph. As I turned back to take one last look at the exhibition Saint Jerome was still quivering behind me. Legend tells that he used to beat himself with a rock to prevent him from having impure sexual thoughts. But as he stands there quivering you can’t help but wonder what is going on beneath the excessive drapery around his legs. However, before there was a chance to cast any aspersion onto the virtue of the saint, someone else had crept towards the pedal and Saint Jerome had returned to whacking himself. 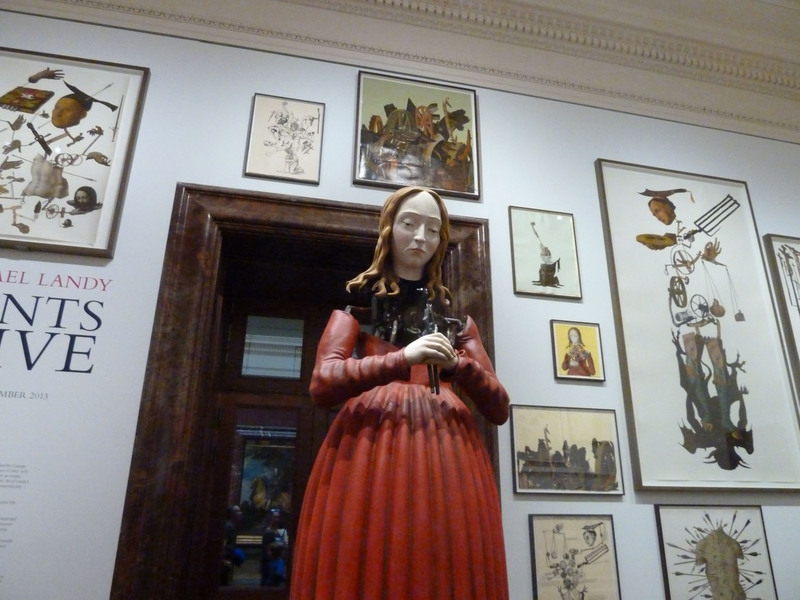 Michael Landy’s Saints Alive is at The National Gallery until 24th November 2013, www.nationagallery.co.uk.